Bigtime Drug Lords Offers 10M reward for Duterte's Assassination - PNP Chief - Exam News, Reviewer, Military Career, & Everything [MN] . .
Incoming chief PNP C/Supt. 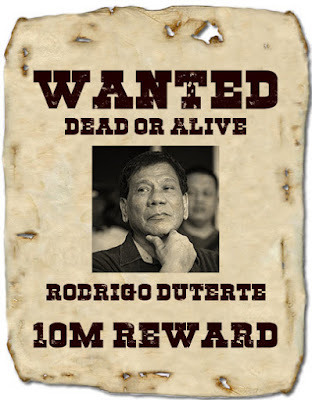 Ronald "Bato" Dela Rosa revealed that bigtime drug lords from Bilibid prisons are planning to assassinate President-elect Rodrigo Duterte with the reward of P10 million pesos. In a report published by Bombo Radyo on June 8, Dela Rosa said that drug syndicates will double the 5M reward money offered by Duterte for those who could capture dead or alive bigtime drug lords as a strategy targeting the Mayor based from an intelligence report. Dela Rosa added that he received report of syndicate meetings who has been seriously affected by Duterte's anti-illegal drugs campaign. On the other hand , Dela Rosa said they're not threatened with the report and even challenges drug lords to show off what they got. Also he explicitly said that any forms of bribery with the police, prosecutor and judge in the Bilibid will no longer work in the incoming administration. The bribery days are already marked.